I just came across this quote this morning and thought it was worth sharing. I’m not Buddhist nor do I want to convert but there is no denying some incredibly insightful words from the Buddha. This is an activity I found online and just tweaked it for my own liking. It’s generally called “10 Things.” On your first day of classes when you are the new teacher or you have new students coming in who don’t know you yet this is a good way to start things off. Depending on the age of the students I may have a little fun drawing a silly stick figure version of me. The younger students really get a laugh when I draw my stick figure and then do the same pose myself. I think it’s important for the students to know it’s OK to have a laugh in class and that their teacher isn’t going to bore them. 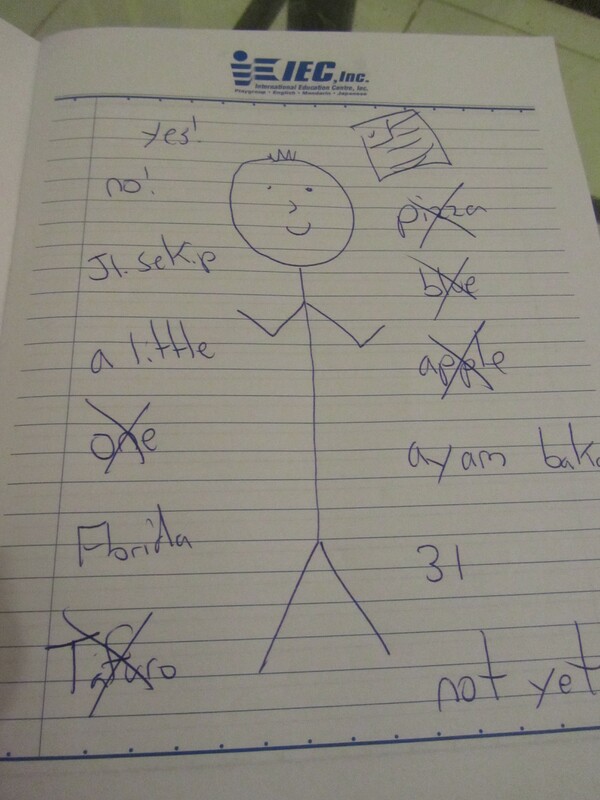 In a few of my classes I drew the stick figure, introduced the stick figure as their real teacher and pretended to walk out of class. It lightens the mood right from the beginning and gets rid of a lot of the anxiety the new students or the teacher may feel. Good morning students, this is your teacher. Then I write 10 things about myself that are answers to a question that I want the students to ask me. I usally start with drawing the American flag and then a few easy ones like pizza, blue, and 31. Where are you from? What is your favorite food and color? And, how old are you? Then I try to throw in a few tricky ones like my last name which gives me a chance to explain to the students how Americans say “last name” but “surname” and “family name” are also acceptable. 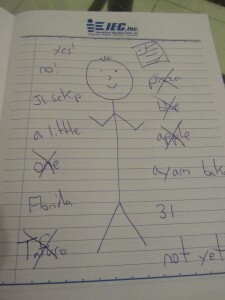 I write a few cryptic ones like just the words “No” and “Not yet!” Do you have a girlfriend? (No!) Are you married? (Not yet) The students here get a kick out of it when I write “ayam bakar.” What is your favorite food in Indonesia? This is a great way to start out the class because it’s a way to introduce yourself without standing there in front of them doing a monologue about your life. When they ask you a question and you answer just cross it off. When you’re finished the activity can either end there or you can give the students a turn. What I did was ask each student to take a sheet of paper out and write 5 things about themselves in the same fashion. I ask them to do a few simple ones and maybe 1-2 tricky answers. Then I randomly pick a few out and write their words on the board. Now I get the students to start asking each other. It’s a lot of fun but make sure you give students other ideas for things they can put down. They get bored with asking their classmates what their favorite color is so really put an emphasis on a few tricky ones to get the class involved in trying to figure it out. This is somewhat anticlimactic for my readers in that I sort of left things hanging as to what my final decision was going to be on teaching. After a rather disappointing interview with the school in Medan I was left hanging for about a week waiting for an answer. I had already made provisions to go to Jakarta. I sent a follow up email and the job I wanted, I got. Fast forward a few weeks of hanging out in Bangkok, I’m now in Medan, Indonesia where I will call home for the next year. My contract doesn’t begin until Sept 12 and ends Sept 30th of next year. It’s been a rough first week here as the accommodation they placed me in is rather uncomfortable. If it’s one thing I’ve learned about myself it’s that I have one absolute non-negotiable when it comes to any housing going forward. There must be A/C. I’m miserable in this room with just a fan. It doesn’t cut it. I had heard some unpleasant things about the other house so I was afraid that I wouldn’t be happy with it but I decided to check for myself right away so I could make a final decision on whether or not I could stay here. The other house is absolutely amazing. There have been reviews online about the conditions there, with leaks and rats and break-ins, but I addressed those issues with the teachers living there now and have assured me those things have been resolved. Although, rats are a part of life here, I see them everywhere. The house I’m in now is big but the one I’ll be moving into is just massive. It has 4 levels, several bedrooms, a big garage. The roommates there seem like they will be easy to get along with. Having fellow beer drinkers is always important. The girls I’m staying with now are really nice but they pretty much keep to themselves. Which is good but at the same time occasionally letting loose will be nice, which just won’t happen where I’m at. The new house has WiFi, a big bed, a washing machine and a balcony. My room will be very big. I observed a class today and it gave me some real incite into how things are going to be. It’s really structured with a specific curriculum, however it’s not so strict that you can’t add your own personality and flavor. In fact, anytime I want to deviate from a lesson plan, I’m allowed as long as the subject matter they want covered, is covered. Most of the students at the school are Chinese-Indonesian. They seem a bit more shy than the Indonesian students I had in Bukit Lawang but I think it will be a fun challenge. I’ll be teaching every age group from around 5 up till adults. Classes seem to range from about 10-15 students with the occasional one-on-one tutoring. This is not a public school, it’s a language center so this is not their primary education. I have over a month before I start so there is no sense in sitting around waiting. Tomorrow I’m going to take a bus to Bukit Lawang to go visit. I was going to wait until I bought a bike but I’m not prepared to make that trip just yet. I want to get some city driving under my belt. I’m excited to see all the friends I made during my volunteer stint. My first stop will be the clinic and then make my way towards the river saying hello to anyone I can. I’ll stay through the weekend probably and maybe even longer. A week long public holiday for the end of Ramadan starts at the end of August. I have to make sure I get wherever I’m going to be, before the holiday and then leave after. There will be no buses running before and after. My plan is to head to Lake Toba and stay a week on Samosir Island. The island is predominantly Catholic so it would eliminate any risk of being stuck somewhere, unable to find food due to the fasting periods of Islam. Plus, it’s really nice on the lake and I can cool off for a little bit. I’ll be back in Medan for good right after September 1st. That’s when I’ll shop for a motorbike and start learning my away around the city. Unfortunately, the guy I’m replacing doesn’t leave till after I start so there will be a 10 day overlap before I move into his room. It would have been nice to settle in the room before but what can I do? That’s about it for the update. I’m just going to be touring around a bit and relaxing so I don’t expect much updating. The waiting game is about to be over. 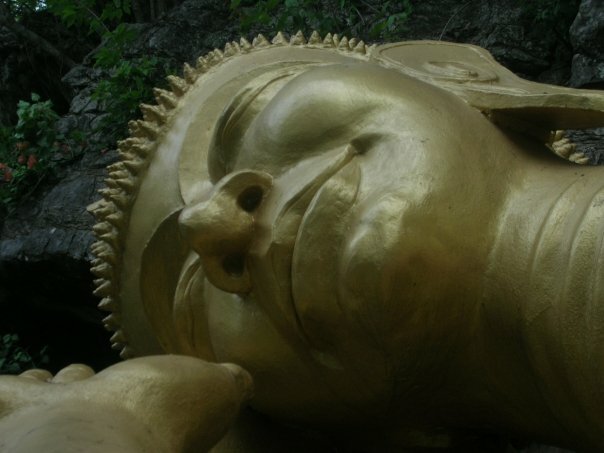 I’m still here in Ban Phe, Thailand. I decided to stay for the weekend and not move around too much because it’s easier to not spend much money that way. If I was in a bigger city the baht flow a lot faster. I have a beautiful room at Christie’s with A/C, hot water, TV and a great WiFi connection. I spend most of the days inside trying not to spend any money. 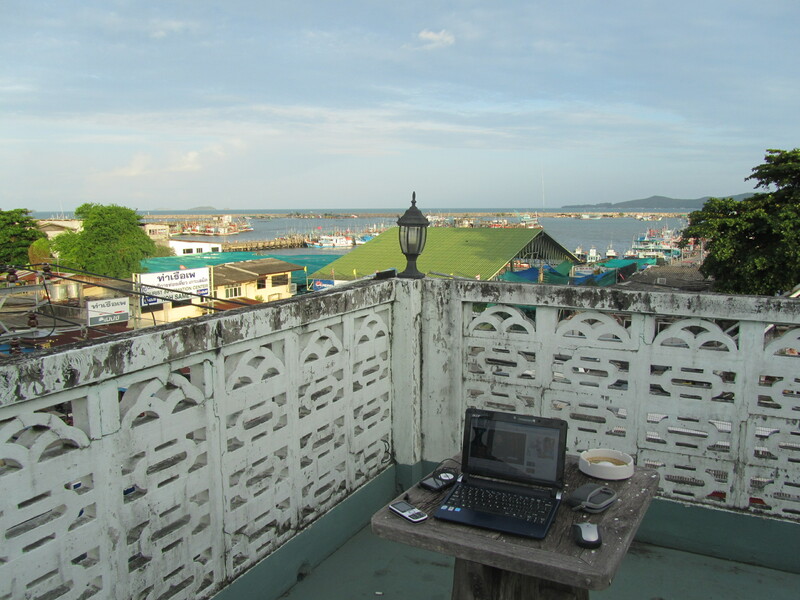 The job in Medan is what I’m holding out for and I was told I would hear an answer a week from last Tuesday. If I do get the job I have to decide if I want to wait till the end of August to start. It is a tough decision because I really want the job but going that much longer with out a salary isn’t the best idea. If I do decide to wait it out I’ll probably stick around Ban Phe longer and rent out this guest house for a month along with a motorbike for a discounted price. The interview itself didn’t go really well last week so I’m not expecting much with that job. That leaves Jakarta, my eternal safety net of a job as my probable final destination. This is by no means a consolation prize as Jakarta is sure to be a great city for me. A lot of people don’t like it because it is a crowded mega-city but I can find the good in most places. If this is the plan then instead of flying the expensive $200 route from Bangkok to Jakarta, I’ll instead take a train south through the Malay peninsula to Singapore and then do a short hop on to Jakarta for much cheaper. Either way, by Tuesday my future should be clear. Either I’m going to live in Medan or Jakarta for at least the next 12 months. 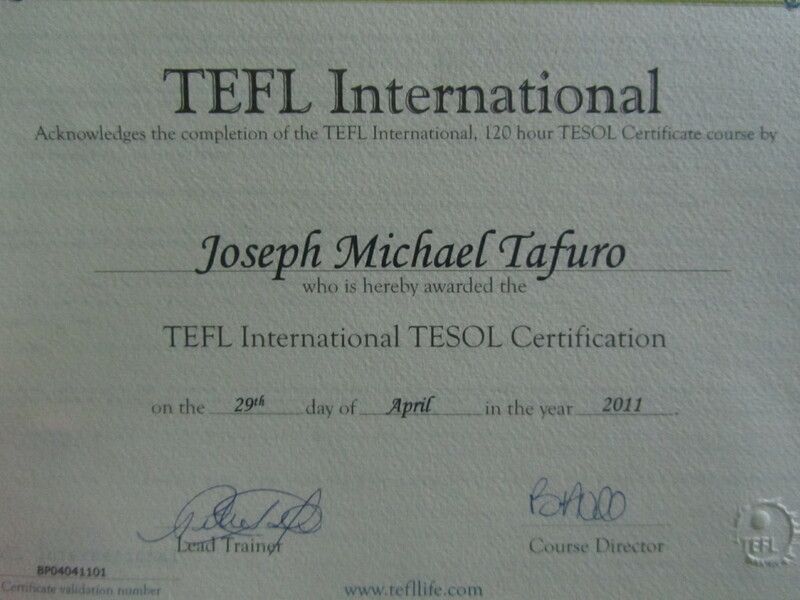 I completely forgot to update the blog with the news that I completed my TEFL course and received my certificate to teach English as a second or other language (TESOL). This is a big milestone in becoming an ESL teacher around the world. 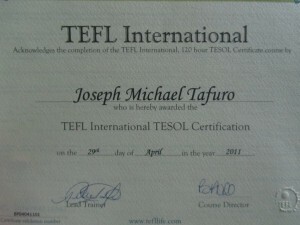 TEFL International has been great. The head trainer was a Florida boy like myself and born in New York with Italian ancestry. He’s the same age as me but started out his teaching 5 years ago and has made amazing strides. His personality and delivery of lessons was engaging and definitely the best part of the course itself. The 120 hour course doesn’t necessarily provide you with the practical tools needed to be an ESL teacher. The trainer’s job is to get the trainees comfortable and compotent as English teachers and I feel that was accomplished in my eyes. It isn’t that a certification is required to teach all the time but it opens the door to more countries, higher pay and an edge on my resume with competitive jobs. The other really great thing about the course was the friends that I made. Dave and Gareth, both from England were together most of the time on the course and really pushed each other to succeed. These are friends that I’ll have for a life time and we made it a point to make sure we stay in contact. Then there was Derek, the 77 yr old Englishman who fit right in with us. His stories were amazing and he is a true English gentleman. I’m going miss all 3 of them and look forward to a reunion somewhere in Asia. If I had one complaint about the course it might be the facilities themselves. They were moving out of the building we were staying in and into a new location and as the last residents they probably weren’t too concerned with fixing pipes or broken appliances. That being said, most of us on the course just sucked it up and dealt with it. Again, in a practical sense, not a whole lot can be taken away from this course. I wasn’t provided with specific directions on how to lesson plan or what day to day life as an ESL teacher will bring. That will only come with experience and research on my own. There were several quotes posted around the classroom and two stood out in particular for me. To me, these quotes basically mean, no matter what the situation, whether it be a mistake made by someone else that you have to a fix, or a problem you create yourself, it is up to you to take care of it yourself. Sort it out! Ultimately, it will always be up to me to make sure something gets done, even if the fact is true that someone else dropped the ball or there are issues out of my control. These are quotes that can translate into almost any profession or part of life. Don’t blame other people. Sort it out. Figure out what you have to do. So, the next step is landing back on the island of Sumatra on Tuesday and begin my life as an ESL teacher with a 2 month volunteer contract in the town of Bukit Lawang. Here we go! I got my first teaching gig! I’m 3/4 of the way through my TEFL certification course and I’ve secured my first teaching position. It started back in February when I was in Sumatra in the tourist town of Bukit Lawang, Indonesia. I did the 2 day jungle trek and really enjoyed the time spent along the river and near the jungle. It was peaceful, quiet and I could fall asleep to the low roar of the Bohorok River. Mosquitos are not a big issue and the slightly elevated and hilly location means there is always a cool breeze in the evenings to make sleep comfortable. The people were friendly and welcoming and I left some people behind with the promise that I would return someday. 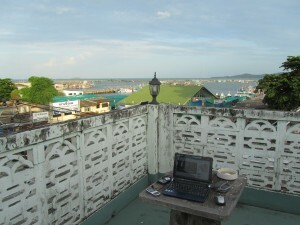 A few days later while in Lake Toba, about 8 hours away, I started looking for teaching jobs online. The first hit I got was an English school that is looking for British teachers to come in on 2 month contracts. I emailed them and got a response within a few days. I filled out my application, told them I have no teaching experience, answered their questions about my ability to adapt to different cultures and waited for a response. I got a very positive response from their offices in the UK saying they’d like to do a Skype interview. I set that up a few days ago and during the interview was offered the position. My prior travels to Sumatra and other conservative Muslim parts of the world was what set me apart. It was a nice feeling because it was one of the justifications I’ve always had for doing heavy travel to parts of the world that are off the beaten path. They sent me a teachers packet and gave me a couple of days to confirm. The packet was a bit daunting. It went through their expectations of the teachers, some welcoming information and a bit of the schedule. The village I’ll be teaching in is about 10 minutes away from Bukit Lawang itself. My first duty is to introduce myself to the head of the village and register my arrival within the first 2 days. Accommodation will be very basic. I’m still working out the details of my schedule. I know for a fact I’ll be working Mon-Thurs but I’m confused on what times my classes will be. I know I’ll be teaching 9-11 yr olds in one session and then adults at university level in the evenings. I’ll have Friday, Saturday and Sunday to myself. For the young ones, their English is very basic so I’ll have my work cut out for me. Going to have to figure out some fun activities to keep their interest going. They said they want me to incorporate ecology and the geography of their part of the world in it so I’m going to have to do some research on Sumatra and orangutan preservation. With the adults it’ll basically be about finding ways to come up with conversation topics. Their English is intermediate to advanced and just need someone to speak native English with. The contract begins May 1st but there is no way I can get there by then. My course ends next Friday and the earliest I can fly out is Tuesday the 3rd. I’ll arrive in Medan in the evening and then the following morning take the 4 hour bus ride to the village. It’s on! What happens after the 2 months is over is still up in there air. I had my second and third days of teaching practice this week. Tuesday was better than my first day and I’ve gotten some nice praise from the trainers. This morning I was a bit off my game but apparently it wasn’t as bad as I thought. Internally I was more nervous. I made a slight mistake at the beginning in a structured lesson and then it threw me off. I regained myself and finished the lesson well. The students are so much fun to interact with. We’re struggling though, because it’s school break right now so they are having a hard time finding students to volunteer to come in. Some of the ones that do come in are really young and a just bodies in the seat. They are too young for the lessons and then become distractions. The ones that the lessons are age appropriate for really seem to enjoy it. It drags pretty hard towards the end of the 4 hours. I had the unfortunate or fortunate task to go on in the fourth hour yesterday after some of the students just heard the same exact lesson. It was up to me to try to find a way to engage them. I did the best I could with gesturing since my chalk board skills are pretty bad. It’s one thing I really need to work on. Although, most schools will probably have white boards anyway. If you go on fourth you get all the trainers watching, all of your classmates and both classes combined. I found it better this way as having more students feels natural. I’m not afraid of the trainers because they both give really good feedback and I’d rather get truth from them than not know what I’m doing. I’m really beat and just realized that I feel like I’m not putting a very good blog post together here so I’m going to go to bed. I have super exciting news but I want to wait till tomorrow to share it. Today was my first day in the classroom teaching. I imagined this day ever since I signed up for this course. I used to break into a sweat just thinking about having a students staring at me while I teach them. The course has gone very smoothly up till this point and I’ve come a long way in building confidence over the last 3.5 years. We spent the weekend working on our lesson plans when we weren’t out celebrating Songkran. We left around 8am for the city of Rayong which is about a half hour away. Thai schools are on break right now until mid-May so finding volunteers to come to the school as students was difficult. We had a very small class. There were 8 students total split between two classrooms. In glorious Joey style, my high confidence entering into the classroom was shattered when someone pointed out that I had torn a hole in the crotch of my pants. Theses pants were just purchased a few days ago after a long evening hunting for a mall in Rayong. I made a quick attempt to use a safety pin to secure the hole but my efforts were fruitless. I just went for it. I adjusted myself as well as I could before hand and went first. The lesson was over before I knew it. One hour flies by when you’re up there. All weekend I’ve been practicing writing and drawing on a white board only to end up using a chalkboard at the school. I broke 4 pieces of chalk in a matter of 5 minutes but eventually got the feel for it. The classroom was pretty hot, as there is no central A/C. The school is outside of Rayong a bit, in a smaller village. It wasn’t comfortable but it’s more typical than getting to work in a fancy school in the big city. There is always a chance I could end up at a school like this. Overall my lesson went really well. The trainer had high praise for me and even went as far as saying it was one of the best first lessons he’s seen. Whether or not that is true, who knows but I felt good up there and only had a few issues with my rate of speech. My preparation and planning paid off and I go back in tomorrow morning and do it all again. For the next 2 weeks there will be lesson planning in the afternoon at night and then teaching the following morning. I’ve known for a long time that I wanted to try the teaching thing out. I spent the better part of a decade strapped to a headset and stuck in a cubicle so it was about time I freed myself from those confines and got involved in a job that a bit more rewarding. The course is going really well so far and I keep getting more and more eager to get in the classroom and start teaching. Tomorrow we observe one of the trainers do the same lesson we’re going to be teaching next week. This was the final week of lectures and note taking. Now, it’s all about being in the classroom and teaching. After the grammar on Monday and Tuesday we started going over classroom management and strategies. 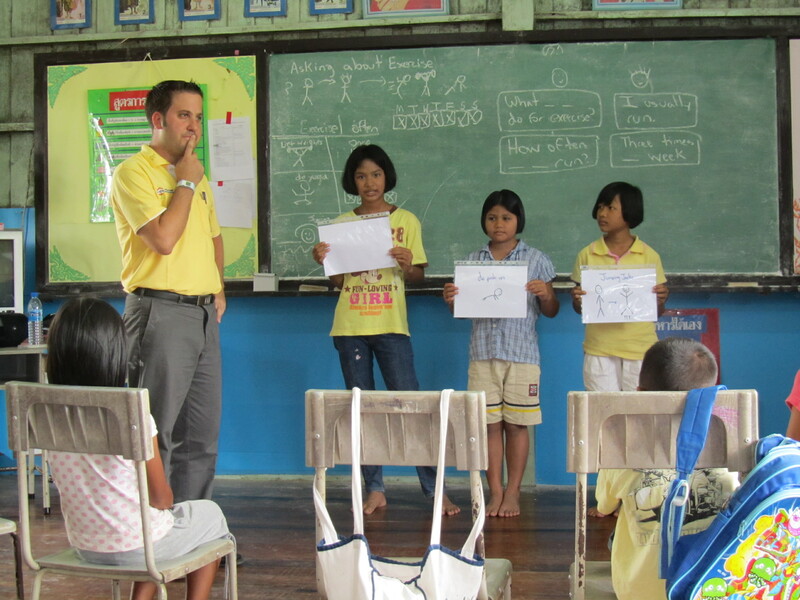 We’ve already learned a lot about what it means to be a teacher in Thailand. There is a high social status that comes along with the title of teacher here that you just don’t get in America. In terms of social status you have the King first, then the royal family, monks and then teachers. Even elders would technically be below me on the social scale. This is important to remember when “wai” ing in Thailand. Wai is the common Buddhist greeting where hands are clasped and placed at different levels depending on the status of the person you are wai’ing. I technically wouldn’t be expected to wai an elder or senior if they knew I was a teacher. This is weird to me and the idea of having someone older than me showing me a higher respect would be difficult to get used to. There are a lot of differences between western classrooms and eastern. There are even further differences specifically for Thailand. For instance, technically, as a teacher we are allowed to hit students. We were told very clearly never to do this as foreign teachers because the discipline doesn’t mean the same coming from us rather than their native teachers. There are sticks just like in Catholic schools of past generations, that can be used to slap on the hand. In addition there are a lot of subtle differences such as avoiding prolonged eye contact with students, giving a lot of personal space and the idea of not singling out any students for poor performance to avoid them losing face with others in the class. 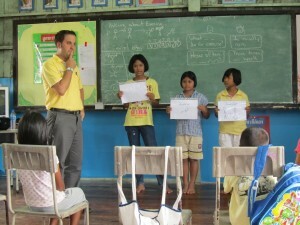 Group work is preferred by students as Thai’s are generally communal when it comes to learning. This is a big difference from American culture since I don’t know any students in college that actually enjoy group activities. Right now it is Friday night, right in the middle of Songkran, the Thai New Year. I will do a write up on Songkran which is an unbelievable event in Thailand once a year in April where the entire country shuts down for a water festival to ring in the New Year. Until that update, have a good weekend and I’ll talk to you soon. Time to go have some fun! I teach my first class at 9am on Monday morning. This means actual students and an actually lesson plan. Finally!